I don’t remember when I first started loving Morgan from Mrs. Priss. I think it was when I saw the flag bunting Anthro knock off necklace. Since then, Morgan has become one of my must-reads. I love her no-sew rolled felt flower. Also, her fabulous variations of yarn wreaths make me want to make about five. And I am totally hooked on because of her (seriously, go buy this friends). 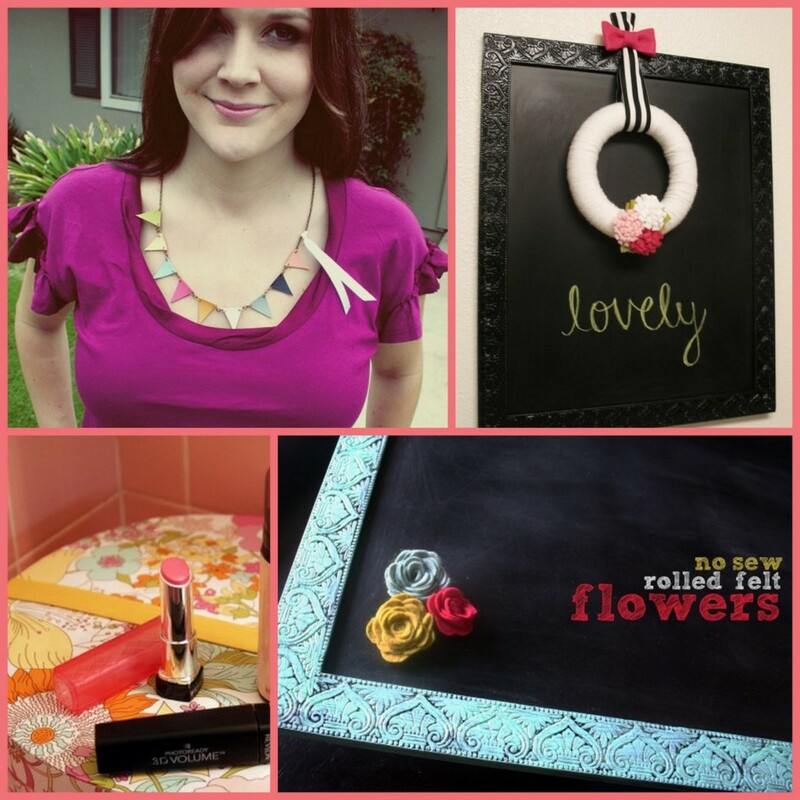 When Kirstin invited me to do a guest post over at this spectacularly crafty blog, I was thrilled. I just love the whole idea of this series! Though I’m not a fabulous seamstress (as most of you sure seem to be), I did come up with a little Anthropologie knock off to share with you all. I hope you enjoy! Anthropologie is such an amazing store. I instantly fell in love with this Pipe Cleaner headband on their website, but who wants to spend nearly $40 when you can make it yourself for SO much less? NOT THIS CHICK. Slip the velvet piping over one end of the headband and slide it until you reach the other end. I was surprised at how easy this was. Secure each end with a dab of glue. Pinch until it dries. Using a the remaining yard or so of piping, slide one end of the jewelry wire through. I found that bending the end of the wire upon itself made this process a whole lot easier! Now you have wired, bendable piping, so let’s make ourselves a fancy schmancy bow! This bow will resemble a double figure 8 when we’re finished. To start, make a single loop as shown in the photo and use the jewelry wire to pinch it in place. Feel free to glue it if you’re paranoid about it falling apart. I won’t judge your OCD, I promise. Continue the figure 8 pattern by bringing the piping back around to the center point. Repeat the process to make a slightly smaller bow on top of the first one. Keep holding it in place with your thumb, sister. We’re almost there! Leave that straggling piece of velvet where it is for now. Take some jewelry wire and tightly wrap the center of the bow to hold it all together. When a problem comes along, you must wrap it. Now wrap it. Wrap it GOOD. It’s been a long day, sorry ladies. 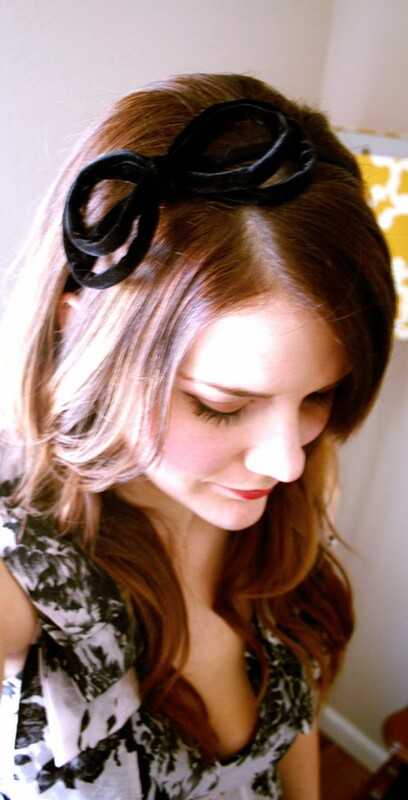 Find a good spot on your headband to place your bow. Where are my OCD gluers? Glue that baby down to the headband. Take that extra piece of velvet I mentioned and wrap it around the center to cover the jewelry wire. I wrapped mine twice, but you don’t have to do exactly what I do. (Unless, of course, you want to be awesome.) Now trim it and glue the end in place on the back side of the bow. You’re done! That wasn’t too bad, right? Thank you for having me, Kirstin! Made one this afternoon after seeing this. I made it for my 6 yr old daughter who was watching hard and while trying to fix the bows she yelled stop it looks like a butterfly so now she has a cute butterfly headband. Thank you for posting this.